Thousands of Norwegians all over the country protested Thursday evening over the arrest of a young woman whose family fled the Caucasus when she was a child, sought refuge in Norway but failed to receive it. Maria Amelie has lived illegally in the country for many years since, and now faces deportation. A court in Oslo went along late Thursday afternoon with a request by the police agency charged with enforcing immigration law that Amelie be held in custody until she can be sent back to Russia. Amelie, now being held in an asylum center near Oslo’s main airport at Gardermoen after her arrest on Wednesday, appealed on the spot. 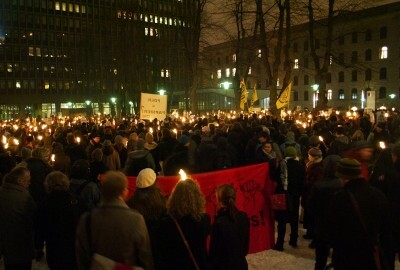 Her detention unleashed massive protests, from human rights organizations like Amnesty International and the Norwegian Helsinki Committee, from politicians for a wide range of parties, and from thousands of ordinary citizens including those who marched on the state government complex in Oslo. 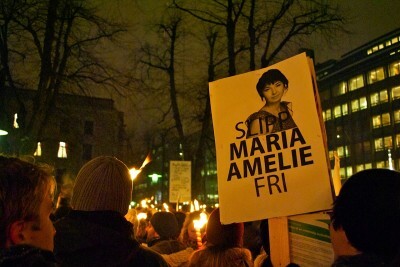 Carrying flaming torches and signs demanding that Amelie be set free, they defied bitter cold and snow to appeal both for her release and for permission for her to remain in Norway. Amelie has lived a third of her life in the country, learned to speak perfect Norwegian, achieved top marks in school and went on to earn a master’s degree in Trondheim. She wrote a book in Norwegian about her experiences last year and was named “Norwegian of the Year” by a local news magazine. Her case clearly has sparked widespread sympathy among many Norwegians, and Prime Minister Jens Stoltenberg told Norwegian Broadcasting (NRK) Thursday evening that he could understand the demonstrations of support for Amelie. He claimed, however, that immigration rules must be followed and be standard for everyone. Stoltenberg noted, for example, that just last weekend, several illegal aliens from Iraq including families with small children also were deported because they could not prove a need for protection in Norway. He faces opposition, though, from within his own government, with fellow minister Kristin Halvorsen of the Socialist Left party (SV) noting the irony of Amelie’s arrest at the very start of a year in which Norway is celebrating polar hero and human rights activist Fridtjof Nansen. Politicians from the Liberal Party (Venstre), the Conservatives (Høyre) and the Christian Democrats (Kristelig Folkepartiet) also opposed Amelie’ arrest, arguing she is precisely the sort of immigrant that Norway needs. Even Siv Jensen of the Progress Party (Fremskrittspartiet), which wants to restrict immigration, thought it odd that the police would arrest Amelie instead of concentrating on other illegal aliens who she claims regularly commit crimes. “It’s difficult to see how a child who was brought to Norway by her parents can be held responsible for breaking immigration law in line with other adults,” said Bjørn Engesland, secretary general of the Norwegian Helsinki Committee. He claimed she has never been offered the chance to be interviewed by the authorities, nor would police share information with her lawyer. “That’s unworthy,” he said. Authorities including Pål Lønseth of the Justice Ministry maintained, however, that she has stayed illegally and the length of her stay works against her, not in her favour. It’s also been suggested that she used false identities, to get through the school system and find work.